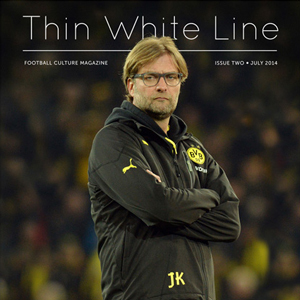 Issue 2 of Thin White Line – on sale now. Free shipping within Australia. Now in stock. Free delivery within Australia. There’s also a cracking in-depth article by Martin Cloake on Football’s Culture Wars, Jesse Fink writes about Australia’s national team’s adventures in Asia in the 1960s, there’s an article on an obscure English goalkeeper and an article on the football culture in the Solomon Islands prison system. We have some brilliant photo essays from Przemek Niciejewski and Jamie E Murray as well. And there are other articles from Mexico, East Timor, England, Australia and New Zealand (sort of) as well as the best spread of advertisements you will ever see.